We look forward to welcoming you to our service reception where refreshments are served in our comfortable waiting areas and in our showroom. Our specialist technicians are highly trained and wondrously adept at servicing, repairs and MOTs to all makes and models right across the automotive spectrum. Your car will be treated with the proficiency and expertise you're right to expect. We'll undertake repairs and servicing without lengthy lead times and without sky high main agent prices. We'll use all the right skills, tools and equipment to work on your car, and on accurate completion of your instructions we'll present a bill that won't make you wince! Since March 2006, the MOT test has become fully computerised. You will not notice any difference when you take your vehicle for a test, except that the MOT certificate will be in a new format. However, the details of the test will be recorded on the database at the same time as your documents are produced. The new test is to a much improved and homogenised standard and will help to reduce crime associated with MOT certification. A major advantage is the ability to tax your car on-line using just the codes on the document. 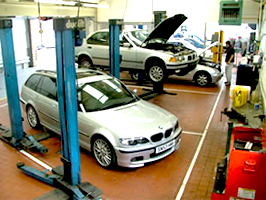 Computerisation not only improves administration for both the MOT station and the DVLA, but also increases confidence in the scheme across the board for both consumers and garages alike. The diesel emissions test requires us to rev the engine from idle speed until the governor cuts in. This is harmless if the engine has been properly maintained, but a poorly serviced car can give rise to problems during the test. Before the test you must know if the vehicle has been serviced in accordance with manufacturer's schedules as this will negate any fast running problems. It is also important to know if the cam belt has been changed as specified by the manufacturer, as fast idling can put a strain on it. Try to get the car up to working temperature before you get to the test as it is helpful for the tester and will produce less smoke. A large number of MOT items can quickly be inspected yourself, with no specialist knowledge or equipment. Have a look at the check list below. LIGHTS The biggest failure item. Do they all function properly? INDICATORS Check front, rear and side repeaters where fitted. BRAKE LIGHTS Are they both working? TYRES/WHEELS Tread depth (minimum 1.6mm), check for sidewall defects and tread pattern wear. All wheel studs fitted and no rim damage. HORN You'll know if it's working! WINDSCREEN WASHERS Must all be functioning? WINDSCREEN WIPERS The blade rubbers should be in good condition and not torn. NUMBER PLATES Must be secure and all digits clearly readable. CHASSIS/VIN NUMBER Must be displayed and legible. DOORS Check that both front doors can be opened from inside and outside. MIRRORS Must be secure and visible from driver's seat. SEAT BELTS Must be secure and the webbing must be in good condition. If you have a personal number plate such as a non-dating Q plate or a different suffix or prefix, you must bring the V5 registration document to verify the vehicle's age. To avoid any inconvenience, it is possible to test the car the car within one month before the existing certificate expires, allowing the new certificate to run from that expiry date - a sensible option, giving up to 13 months MOT. We'll carry out any minor repairs and adjustments for free; you'll just pay for the parts. Repairs taking longer than half an hour can usually be done on the day of the test. If we re-test your car within 24 hours and the car hasn't left the premises, there is no further charge. To arrange an MOT test, simply call in or phone 0208 549 7000.